In April 2005, we were a goup who went to japan with Yoshigasaki sensei, for a cultural visit in the north of Japan. In the week to follow 5 of us went sightseeing in Kyoto and Tokyo. In Tokyo we had a chance to train with Moriteru Ueshiba Doshu of Aikikai, and with Kato Shihan. Nori Sensei, student and administrative assistent to Kato sensei, was kind to send us this translation of an interview with Kato sensei, from a japanese "Aikido Tankyu" Magazine. Interviewer: Sensei, please let us know why you decided to learn Aikido. 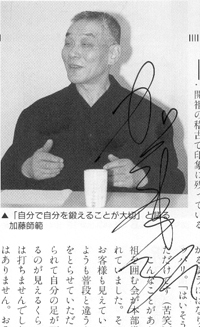 Kato: I did not have a particular interest in Aikido, but I wanted to learn martial arts. My mother knew someone who did fortune telling. This person also knew the founder of Aikido. The fortune teller read my situation and found that Aikido was the one for me. So, without any specific intention, I started to practice around Showa 28 (1952). Interviewer: How was the atmosphere of practice in those days? Kato: I only remember I lost myself in practicing. There were many tough people and it was hard for me. Interviewer: Would you tell us some memories you have of the founder? Kato: He did not say anything in detail about Waza (technique). Rather than listening to his words, I learned by watching him. I haven’t accomplished what I sawprobably less than half of it. When he took my hand, I felt like I was being absorbed into him because of his God-like presence. One time, Osensei gave me a chance to give him Shiatsu on his shoulder. As his muscle was bouncing back, I noticed his back muscle was extremely flexible. Whenever I had such personal time with him, Osensei used to tell me stories. Interviewer: What kind of stories were they? Recently, at last, I am starting to understand what he said. I did not have any sense of it at all during that time. I just listened to his words and simply said, "yes" to him. I remember one incident. 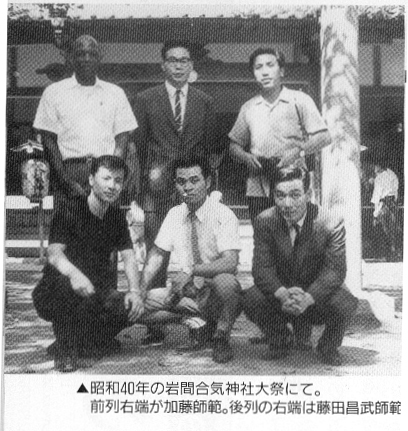 During those days, at Hombu dojo, we had meetings with Osensei regularly. One day, an important guest was in the meeting and he seemed different from other days, uplifted and full of Ki energy. I was Uke and I was thrown to the degree that I saw my legs with the ceiling in the background. I could not do Ukemi at all. It was almost like Jinshin nage. I was really scared. 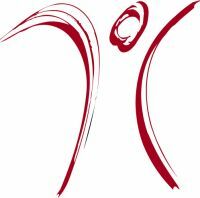 Each Aikido teacher has his own idea and way of practicing and teaching. I think it is because the founder did not really teach as if there were only one mold or pattern. Therefore, I think each individual style has developed out of his teachings. "Extreme softness controls hardness", (a Japanese maxim) is not always true. "Extreme hardness controls hardness", he used to say. And extreme softness controls hardness. Extreme hardness controls softness and extreme softness controls softness. When I think about them, all of them are really true. Depending on the situation, each concept is important. Osensei did not really stick to only one concept, but embraced many. Interviewer: What kinds of things do you pay attention to when you are instructing or explaining? Kato: I tell everybody to try it anyway even if you don’t understand it. Results come as you practice. People do not understand when I explain it verbally. Words are a convenient tool, but to show them how is more important. When it comes to teaching, people generally say “This should be done like this.” It is easier that way. However, in this way, the amount of verbal instruction tends to increase. For example, when I tell students how to take people down without using force, I demonstrate this to help people understand the sense of it. Then, I let people try it. Then, from that, learners take it from there, sensing what it feels like. After that, if they are willing to be stronger, I tell them to do it by themselves. There are no Aikido competitions, so instructors can’t force them to do it, can they? Seeing is much better than hearing hundreds of times. It is my great privilege to have had the chance to see the founder doing it. I really feel that I learned Aikido from seeing it. Interviewer: What did you think about Kotodama, the spiritual principle the founder talked about? Kato: I think vocalizing from Hara lets our Kimochi (feeling/emotion) be present out there. I won’t say that I haven’t studied it, but I am afraid studying it too much ends up in word play. And my face should have the expression of God and become enlightened to talk about it. Or else, I don’t feel my words come from a natural place. I feel awkward pretending to be a little God. Martial artists ensure that their words and actions are congruent. When verbal experience leads, it binds you. If that happens, I tend not to be at all free. Interviewer: What do you think about strength in Aikido? Kato: Strength is many things, isn’t it? Taking other people down is one strength. But persistence in practice, and becoming good at dealing with others, are also strengths. It is holistic, I think. It may be easier to train the body to take people down. Showing strength in Wa (peace) and Musubi (connection) is very different from that. It is more difficult to attain and requires more strength. Unless strength is found in embracing others with a full-fledged humanitarian perspective, it is not pertaining to strength in Aikido. It is important to ask oneself “What is Aikido?” and develop one’s own perspective. If you choose not to fight, then why don’t you do that? Searching for ultimate answers like that is a necessity in doing Aikido. Aikido is not Kumiuchi, traditional martial techniques for fighting. If Aikido were like techniques for fighting, the way of practice itself would be totally different. But Aikido practice consists of ways to develop ourselves and each other. Of course, it is not saying that being weak is acceptable  through our experience of strength we are not tempted to fight. Aikido is not about competition. A person who has true strength does not fight. Again, going back to the regular meetings with Osensei, on one particular day, some writers who were specializing in Japanese tales of Samurai and Shogun came to see the founder. The authors started to talk about the technique of Sen sen no sen (responding before an attack) and Ato no sen (countering an attack). And the founder started to say, there are no such things. In Aikido, people win even before their fight starts. He had a view of winning that encompassed everything, that makes it into oneness, and a value system that transcends the concept of winning and losing. Master Kisshomaru, Osensei’s son, was like that also. He was really a tough teacher. Especially in terms of judging students, his perception and discernment of people’s integrity was very strong. Although I don’t mean he was a cold person. And above all, he acknowledged teachers who had a strong individual style. That is wonderful. It is hard to acknowledge someone who is doing a different Aikido from one’s own. In order to do that, it requires extreme generosity as a human being. That is also one of the strengths found in Aikido. It is very different from how skillfully you can perform your technique. Interviewer: Do you have any last words of advice? Kato: I was not a full-time disciple of Osensei and I had a job during that time. So, I could not spend much time with him. Therefore I had to train myself and practice it. There must be many ways to do it, for example using sword and jo (staff). If you really establish your individual style, you should practice it alone. Practicing is like that fundamentally, isn’t it? If you are young, you should practice to your physical limits. While practicing, you discover your own thoughts and worldview. If you keep doing that, your experience will bring you something to tell others. You train yourself. If you train yourself, do it alone. That is my ideal in my practice and words to you. Practicing Aikido is to keep believing in and searching for something. Aikido, in the end, is belief. It is not a religion. But while you practice it, you gain strength in that type of awareness. I believe in the founder and his words. Still now, he lives in me. If I keep practicing Aikido with that attitude, it naturally fosters spirituality in Aikido. If it weren’t there, it would end up only at the level of physical strength. I feel it is important to practice it peacefully, without fighting each other. Also, I do not like the concept of instructing others in what to do. I am very adamant about that (smile). For me, rather than teaching, I think practice is the place to begin by oneself and with comradeship. Let us practice together. The founder told me once, "I do not have any disciples at all. There are no disciples but many comrades to accompany me. I have companions to attain the truth of this philosophy." Shinran (a famous Buddhist born in 1173, a founder of Jodo Shinshu) said a similar thing. I love their words. Let us practice together.